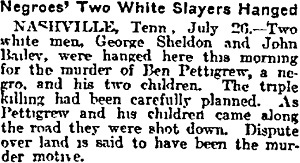 On this date in 1912, George Shelton and his brother­-in­-law John Bailey were executed in Nashville, Tennessee for the murders of Ben Pettigrew and his two children. One of them can be identified as a daughter named Pearl. The other child’s identity is unclear; it may be another, unnamed daughter, or a son named Fred. This is an unusual case because, in the Jim Crow South, these two white men had faced the death penalty for killing black victims, and their crime was characterized by many as a lynching. On December 5, 1911, Ben and his two children were taking a load of seed cotton to a cotton gin in Savannah, Tennessee when their wagon was ambushed on the road by four white men. Accounts about the murder differ as to what exactly occurred: one story is that Ben was shot and his two children hanged, and their bodies put on top of the wagon and set on fire with the cotton. Another has it that all three victims were tied, alive, on top of the load of cotton and then it was set on fire. Also unclear is the motive for the crime, if there was any motive at all. According to some stories, the killers may have been white land tenants angry that blacks were occupying their former homes. It’s possible that they were jealous of the Pettigrew family’s respectability and economic success. Other farmers in the area saw the fire and hurried to extinguish it, arriving just in time to see the four suspects run off into the woods. A posse assembled to hunt down the killers; it started out with 50 men and quickly grew to over 300 volunteers, with bloodhounds. In due course two people were captured; the others got away. To the, Publick, and the, honer, cort, of decaturville, Tenn; we was assoated with Mr. J.M. Hill he read the Bible, to us, and talked to us, about our soles, and, all so Read To Us in St. Mathews the 10th Chapter and the, 26 Verce, that thire was nothing covered but, what would, be uncovered and nothing hid what would, be knowen and, he talked to us about telling the truth at the blessed Jesues, said that to tell the truth and, bleave the truth and it would make us, free and we do know that we did a great rong but god has forvie us, as Mr, Hill, had us us to go to god and, he has forgive us, and now we with up stretched, ormes, ask the clemences, and mercies, of, the, People, and, the, cort, to do all the cane, for, us, as we, air both maried boyes and, i Georg Shelton aire onley 18 yares, old. and, never, Had, the, chence, to go to school and raised up by a Good Fother. And, Oh, My, Der, ole, Mother, and my, Wife, and, Little, Baby! If, i, Had Onley of, Knowen at the start what all this would of, cause, me, i would Not, of done, it, for aney amount, of, Money, But, Mr, Lige Scott, tole, me to; That ole Ben ort to be, Killed, and got, out, of, the neighborhood. And John Bailey, is, A Brothernlaw of, George Shelton, and, is 24, yares, old, and His Parints, Died, when he was a Little Boy, and, he, was raised up heare and, yonder, and, kik from Piller, to Post and, we Both, have, no Egacation, and never relised what a black Path, of, sin we have been travling, till Mr. J.M. Hill, Read, the Bible to us, And Praid, for and with us, and then we begin to Relise what we had done.